Waiting on Wednesday idea from Jill at Breaking the Spine. The Kane Chronicles: The Red Pyramid by Rick Riordon. Carter and Sadie have nothing in common but their parents: their father Dr. Julius Kane, a brilliant Egyptologist, and their mother, a famed archaeologist who died under mysterious circumstances when they were young. The siblings barely know each other, but one night, their father brings them together at the British Museum, promising a 'research experiment' that will set things right for their family. His plans go horribly wrong. An explosion unleashes an ancient evil - the Egyptian god Set who banishes Dr. Kane to oblivion and forces the children to flee for their lives. Now orphaned, Carter and Sadie must embark on a dangerous quest - from Cairo to Paris to the American Southwest, to save their father and stop Set from destroying everything they care about..."
This book sounds absolutely brilliant! 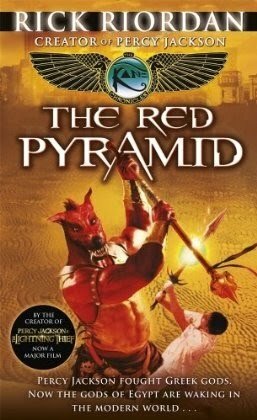 I've always wanted to read Riordon's Percy Jackson series, but never got round to it until recently when I brought the first book, Percy Jacckson and the Lightning Thief. This series however, I intend to get involved right from the get go. I've always had an interest in Egypt and their myths and different practices. In GCSE History, we did Medicine Through the Ages, and the Egypt section was by far the most interesting and fascinating, only adding to my love of everything Egypt. The pyramids. The Pharaohs. The gods. Everything just feels so magical. Very excited to read this! Good week this week! Well day actually, as I got all of these today! The first two, out of a 99p shop! And the third out of Poundland! Absolute steals for the books they are. It kind of feels like theft getting them at that price! 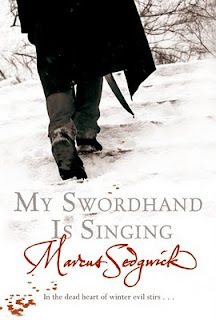 My Sword Hand Is Singing by Marcus Sedgewick. "In the bitter cold of an unrelenting winter Tomas and his son, Peter, arrive in Chust and despite the inhospitability of the villagers settle there as woodcutters. Tomas digs a channel of fast-flowing waters around their hut so they have their own little island kingdom. Peter doesn't understand why his father has done this, nor why his father carries a long battered box everywhere they go, and why he is forbidden to know its contents. But when a band of gypsies comes to the village Peter's drab existence is turned upside down. He is infatuated by the beautiful gypsy princess, Sofia, intoxicated by their love of life and drawn into their deadly quest. For these travellers are Vampire Slayers and Chust is a dying community - where the dead come back to wreak revenge on the living. Amidst the terrifying events that follow, Peter is stunned to see his father change from a disillusioned man to the warrior hero he once was. Marcus draws on his extensive research of the vampire legend and sets his story in the forbidding and remote landscapes of the 17th century. Written in his usual distinctive voice, this is also the story of a father and his son, of loss, redemption and resolution. I've wanted to read this for a long time, seeing and hearing a lot of people rave about it, but I never got round to it! Now thanks to the 99p shop, I get to! Beautiful hardback! Stunning artwork! 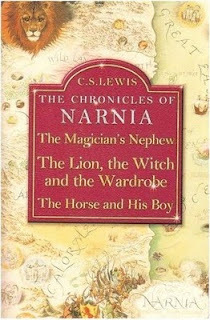 The Chronicles of Narnia: 3 in 1 collection by C.S. Lewis. "The first three books in the magical tale of Narnia, Timless classics that will loved generation after generation." Again, I've never read the full series. I've only read the classing The Lion, The Witch And The Wardrobe, so very very excited to finally read the series. "The dreadful secret that Torak carries with him at the close of SOUL EATER is revealed and he is cast out from the clans. It's his fourteenth summer. He's alone, cut off even from Wolf and Renn. Hunted and on the run he takes refuge in unknown territory - the haunted reedbeds of Lake Axehead, where he is menaced by the Hidden People. Other threats lurk nearby and his battle with the Soul-Eaters is far from over . . .
As he fights for his life Torak uncovers a deception too awful to contemplate, one that shakes him to the core and shatters his world." I've already got this. Both in hardback and paperback, but I saw it in Poundland today and nearly fainted. Michelle Paver at £1! And in hardback as well! An absolute steal. Brought 2 copies. One for me, to get her to sign as my other copy is bookplated, and one for my friend reading the series. 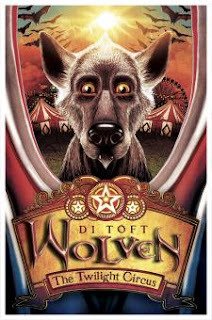 WOLVEN: The Twilight Circus by Di Toft. Official summery: "Having spent the summer dodging mutant werewolves and barking-mad scientists, Nat Carver and Woody, his shape-shifting friend, have joined the Twilight Circus of Illusion before going in search of Woody’s long-lost clan. But instead the boys are caught up in a thrilling new adventure, this time against the forces of evil in the guise of a black widow vampire and her terrifying hive. Featuring a fantastic lenticular cover, this is the second in the bestselling series of fast-paced, funny and accessible stories about a boy and his shape-shifting dog, jam-packed with all the hairy fun and adventure that thrilled readers in the first book – and a howl lot more!" I have to say, after the slight diappointment of Book One (you can read my review here) this book sounds brilliant! Quite excited to read it to be honest. I'm going to have to get it even just for the cover! I love how the cover for Wolven changes, so I'm excited to see the cover for this! It truly is a work of art! Written by: Diana G. Gallagher. 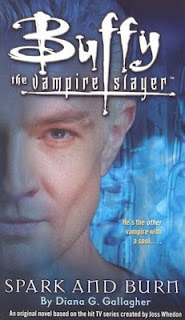 Official synopsis: "In SPARK AND BURN, fan-favourite Spike - the other vampire with a soul - takes centre stage. For centuries he was a bloodthirsty scourge of humankind, killing without bias, feeding on whomever (or whatever) came his way. That would all change when Riley Finn and the covert organisation known as the Initiative planted a microchip in his brain which rendered him incapable of harming a human being. 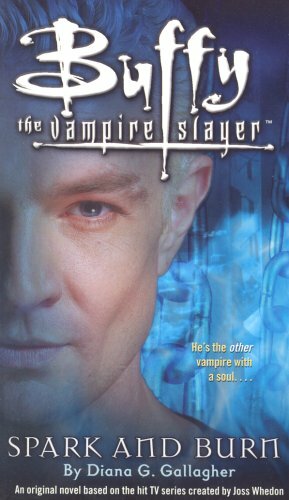 As Spike learned to cope with this handicap - the worst a vampire could imagine - he found himself falling in love with the woman who had been his nemesis - Buffy Summers, the Slayer. Their relationship is a stormy one, with years of mistrust between them. But after Spike regains his soul, undergoing terrible trials in the process, he and Buffy come to a kind of peace with one another; and Spike, finally, begins to find peace with himself." I was given this as a gift by my Nan (RIP) a few years ago. Probably 3 or 4 now. But I'd never read it until now, which I'll admit is shameful. Even more shameful now that I have read it and now know what I missing! Spark And Burn is a brilliant book. Yes, it re-hashes many scenes from the series, but it is brilliantly written. And a true Buffy fan would love it, just like I did! There are some new scenes in there that I think are excellent. Diana G. Gallagher has a good understanding of the characters. The book is told entirely from Spike's point of view! It mostly takes place in the episode 'Lessons', the openning episode for the fantastic seventh season of the show. He's going mad in the basement, and is having flashback after flashback, reliving scenes throughout the entire back-catalogue of the show. It's interesting to really get a good idea of what Spike thought of the other main characters towards the start of the series, and seeing these thoughts change. An excellent book! If you can get your hands on this book, do! I have a few more Buffy books that I am going to have to dig out and read thanks to this one! Michelle Paver News - New Book! Yay! So excited about this. I knew about this about 2 weeks ago now because I am part of the moderating team (called Clan Guardians) on her official website/forums, and it has been so hard to keep my mouth shut about something that I am so excited about! Orion has snapped up world rights to an adult novel by bestselling children's author Michelle Paver. Malcolm Edwards, deputy chief executive of the Orion group, and deputy publisher Jon Wood struck the deal for Dark Matter from Peter Cox at Redhammer for an undisclosed sum. The team will publish in hardback on 21st October. The novel is set in 1937 on the Norwegian Arctic island of Spitsbergen, now known as Svalbard. 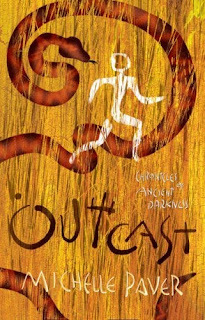 The story focuses on a group of hopeful young Englishmen who set off with ambitions of scientific discovery, only to find there is something sinister lurking in the snow. Paver explained: "I've always loved ghost stories and for the past decade, I've had Dark Matter at the back of my mind. Dark Matter is my attempt to capture the beauty and menace of the Arctic, in a ghost story that will scare the hell out of you." Wood said: "If you've ever woken up in the dark and blindly searched for the light switch, convinced there is something in the room with you, then you will know exactly how this novel makes you feel. When you add in an intensely powerful personal story and the wonderful atmosphere of the Arctic, you have something pretty special." Edwards added: "Quite simply, Dark Matter is brilliant. I just couldn't put it down. We fully expect it to be a remarkable worldwide success for Michelle." Paver is one of the top-selling authors in the UK. According to Orion, her children's series, The Chronicles of Ancient Darkness, has sold one million copies in the UK, and two million copies worldwide, with sales in 33 territories. So excited about this! So very very very excited! (And although it says adult novel, her agent told me and the rest of the moderation team that it's 16+). 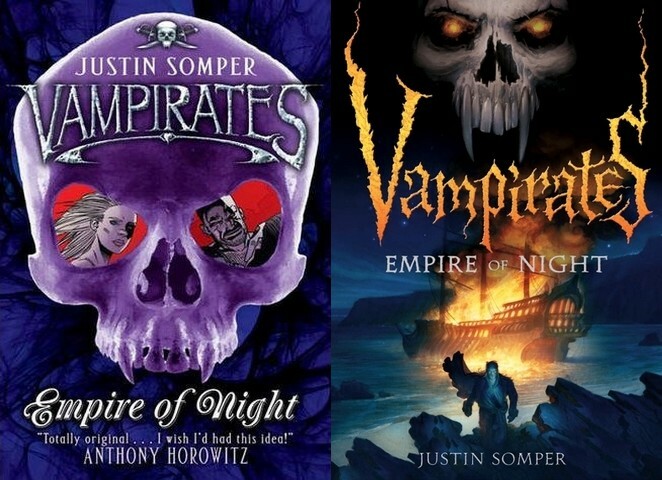 Now, being a big fan of Justin and his Vampirates series, (and of course running the fansite, TheNocturn), I take a big interest in the international covers for the books aswell as my native UK covers. When S&S changed the covers of the series, launching Black Heart as the first with the new style, I have to say I was mighty annoyed. Why fix something if it isn't broke? But I have since fallen in love with them, and the design of Empire of Night is just perfect. The comic book/manga style reverse on the front cover is brilliant. On the other side of the pond in the US, I've never really been a fan of the UK covers as they've generally been a little bit of a re-hash of the UK covers, just in a different style. But now Little Brown are also re-launching the series with a stunning new look. A look for the series that makes me want to emigrate I love it that much! The cover for Empire of Night, as you can see about is completely and utterly stunning. My favourite book cover of the year so far, I hasten to add. I am seriously going to have to import a copy of this. It's perfect. The colours. The skull. It really fits the horror side of the story. Bravo Little Brown. So for this one, the US cover gets my vote. A very rare occurrence as normally I prefer the UK art for most books! Published by: Atom (UK), Little Brown Books (US). Released: 2nd August 2008 (US), 4th August 2008 (UK). Official synopsis: "To be irrevocably in love with a vampire is both fantasy and nightmare woven into a dangerously heightened reality for Bella Swan. Pulled in one direction by her intense passion for Edward Cullen, and in another by her profound connection to werewolf Jacob Black, she has endured a tumultuous year of temptation, loss and strife to reach the ultimate turning point. Her imminent choice to either join the dark but seductive world of immortals or pursue a fully human life has become the thread from which the fate of two tribes hangs. Now that Bella has made her decision, a startling chain of unprecedented events is about to unfold with potentially devastating and unfathomable consequences. Just when the frayed strands of Bella's life - first discovered in Twilight, then scattered and torn in New Moon and Eclipse - seem ready to heal and knit together, could they be destroyed...forever?" I can't pretend that I am not infinitely disappointed with Breaking Dawn. In actual fact, I'm pretty annoyed. Yes, we all want happy endings, but something that annoys me about Bella is that she always gets what she wants, and she goes about it in the most obnoxious manner. I fell in love with Twilight, and really did not like New Moon, but Eclipse restored my faith in Meyer. I adored it. And for the most part, I adore Breaking Dawn. I can't fault Meyer's writing. It's still as addictive as the previous books in the series. But I felt that at the end of the 700 page epic, that things all just seemed to simple. I know there was a fair share of opposition in the book, from Edward as regards Renesmee until he could hear her think, and so on. But it all just seemed too easy. Bella just gets what she wants. It's kind of boring to be brutally honest. For is being the final book, I would also of liked it to be a bit more action-packed. I LOVED Jacob's part, after initially saying it was boring. I quickly changed my mind, and was disappointed when the narrative reverted back to Bella. It just seemed to flow more naturally coming from Jacob. All in all, Meyer has done a good job. It get's a 4 out of 5 from me, because it is a good book. It would of been a 5 had there been a bit more drama, a bit more soul. Maybe one day if I return to the series to read them again, I'll change my mind, but these are my initial views. Satisfied, but a little disappointed. The Short Second Life Of Bree Tanner: An Eclipse Novella by Stephenie Meyer. Published by: Atom Books (UK). Little Brown Books (US). Release date: 5th June 2010. Amazon summary: "Fans of The Twilight Saga will be enthralled by this riveting story of Bree Tanner, a character first introduced in Eclipse, and the darker side of the newborn vampire world she inhabits. In another irresistible combination of danger, mystery, and romance, Stephenie Meyer tells the devastating story of Bree and the newborn army as they prepare to close in on Bella Swan and the Cullens, following their encounter to its unforgettable conclusion." I for one am very very excited for this. I absolutely adored Eclipse, and thought that the ending chapters were utterly brilliant. To get to see that from a different perspective, to see what went on literally behind the scenes, and from the perspective of a newborn at that is going to be very exciting! Official synopsis: "Sidorio, fuelled by grief and revenge, is intent on becoming King of the Vampirates and building a new empire to bring terror to the oceans. He faces growing opposition from both the Pirate Federation, including Vampirate Assassin Cheng Li, and the Nocturnals - the more benign vampirate realm - led by Mosh Zu and Lorcan Furey. 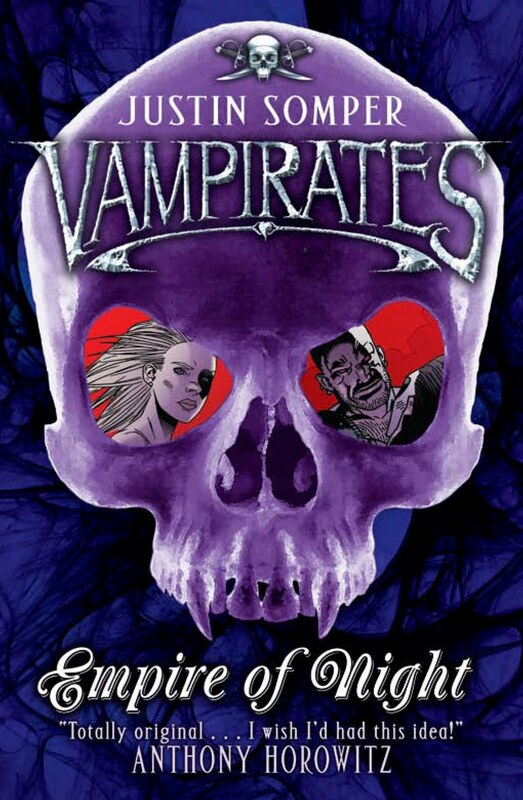 Both the pirates and the Nocturnals are forced to raise their game in response to the new and urgent threat from Sidorio and the renegade Vampirates. Twins Grace and Connor Tempest, still ricocheting from the recent discovery of their true parenthood and its explosive implications, are thrust deep into the heart of the conflict. Old foes and allies are thrown together in unexpected ways and, as the stakes rise higher than ever before, Grace and Connor find their alliances shifting in ways no-one could ever have possibly foreseen..."
Empire of Night is the fifth book in Justin Somper's terrific Vampirates Series. 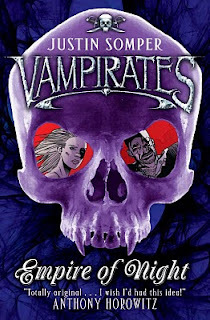 Blending piracy with vampirism is not an easy task, but Mr. Somper does a terrific, neigh... AMAZING job, as this book only proves. This book has a slightly different style to the previous four. The openning chapter, well, prologue, actually takes place in the closing chapters of the book. Rather frustratingly, this prologue is absolutely amazing. So descriptive, so addictive. I was hooked instantly, and then to have to return to the start of the story, and have to wait to see what happens next was a major task! I had to fight tooth and nail not just to flip right to the end and see what happens next! Believe me though, it is totally worth waiting for! Do not, under any circumstances flip to the end, like I was tempted! After the revelation at the end of the last book, Black Heart, there are some interesting developments involving the twins, Grace and Connor, and their growing appetite for blood. This for me was a massive highlight of the book. I really don't know what else to say, what else I can say,without spoiling the book. All I can say, is that it is by far my favourite of the series. With some stunning twists and turns, major deaths that shocked me to the core, really! It's not very often a book makes me cry, but I did shed a few tears at the death near the end! Well done Mr. Somper. One extremely happy Nocturnal here! Excited to see what you have up your sleeve for Book Six! I cannot recommend this book enough. The series too! If you haven't read them yet, what are you waiting for? Harry Potter Series Gets A Face-lift! JK Rowling's phenomenal Harry Potter series is getting a face-lift! 7 stunning new covers have been designed by by renowned linocut artist Clare Melinsky. Clare Melinsky’s illustrations follow the style of traditional woodcuts and will appear on the front cover, back cover and spine for all seven titles in the Harry Potter series. The "Signiture" Look, as it has been daubed by Bloomsbury, will be published exclusively in paperback on 1st November 2010. I for one shall be buying these! Look amazing! Okay, so this probably doesn't qualify as news, but for a JK Rowling fan, like me, this is cause for celebration! Jo was reading at the White House yesterday for their annual Easter celebrations, and in a Q&A, she said that she has written a few things since she finished the epic Harry Potter and the Deathly Hallows, and that there will be something published in the "not too distant future". All I can say is please... BRING IT ON! Anyone else excited that the prospect for new JKR reading material is coming around? 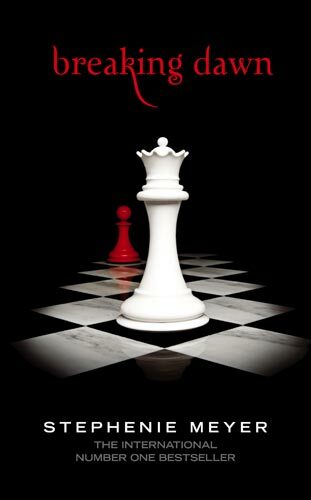 So, Stephenie Meyer is set to release a brand new book on 5th June! 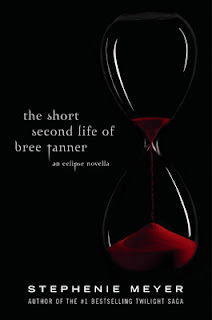 The Short Second Life Of Bree Tanner: An Eclipse Novella is a 192 page tale of Bree Tanner, the new-born vampire who appears at the end of Eclipse. Meyer said she wrote the "short story" to get a perspective of the other side, and then intended for it to be featured in her upcoming The Twilight Saga: The Official Guide. But it was too long, and now it is being released in hardback at 12:01 on Saturday 5th June! It is also going to be available to read online, for FREE, from 7th June to 5th July. I for one am very excited. I loved Eclipse and am in the last few pages of the incredible Breaking Dawn at present, and so getting to read Bree's full story is going to be very interesting. Kind of like how she planned Midnight Sun to be Twilight from Edward's perspective. I also love the cover art. I love all of the saga's covers. Hey everyone. As you've probably noticed, I haven't been around for a little while! We moved 2 weeks tomorrow, and have had no internet. We get it back this coming Wednesday at long last. I am currently at my cousins, borrowing their wireless! Empire of Night, Breaking Dawn, and whatever else I might read over the next few days.